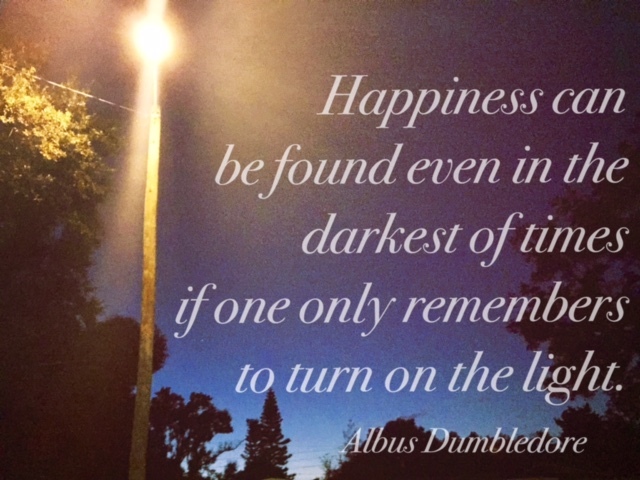 I took this picture the other night on an evening stroll with Babe and it reminded me of one of Albus Dumbledore's most famous quotes. It may not be the very best of pictures, it may be grainy and dim, but that's kind of how it works isn't it? Happiness doesn't always come wrapped up in the prettiest package or riding a gleaming white horse. It comes in the smallest moments, that build upon each other, until they shine with a brightness, that even the darkest of nights can't snuff out. Great quote... and, the illustrated edition of Harry Potter and the Sorcerer's Stone... I've heard of that! I'm glad you think it's worth buying. It would make a great Christmas gift. Great quote and great reminder. It seems that often are so busy pursuing happiness that they never stop to just enjoy the moment. More often than not, there are opportunities for gratitude and happiness right before us. Exactly! Thanks for the encouragement and stopping by :) Happy Monday!